Abraham Lincoln was the brightest star, he was born very poor, had several set backs in his life, but proved to be one of the best presidents of USA. He was born in a one-room log cabin of a farm, south east of Harden Country of Kentucky, USA on 12th February 1809. His father Thomas Lincoln and mother Nancy Hanks Lincoln were very poor and uneducated farmers. Abraham’s mother died when he was child. His father married again and fortunately his step-mother also loved Abraham very much. He used to help his father in farming as a manual labor. He used to read and write by the kitchen fire while his mother cooked. He continued his academic pursuits with his own earning through hard work and completed his law. Young Abraham used to walk even 30 kilometer to hear public lectures of great orators. Abraham was married to Mary Tod. He had four sons but only one survived to maturity. Three died in childhood. In spite of loosing three children when his son went to school for the first time Abraham wrote a document as “Letter to the World”. This reflects on his philosophy of life. Abraham wrote to the World that his son has to start on a great adventure that probably would include wars, tragedy and sorrow. To live in this World his son would require faith, love and courage. His son has to learn that for every scoundrel there would be a hero; for every enemy, there would be a friend. Bullies are the easiest people to lick. Abraham wanted his son to learn that it is far more honorable to fail than to cheat. He should learn to have faith in his own ideas, even if every one tells him to be wrong. His son should learn strength not to follow the crowds. He should listen to others, but filter all he hears on screen of truth and take only the good that comes through. His son should never put a price tag on his heart and soul. He should learn to close his ears on the howling mob and to stand and fight if he thinks he is right. Abraham wrote that test of fire makes fine steel, however he wrote that all these things should be taught gently. Abraham suffered from a severe disease “Mar fan Syndrome”. He struggled through severe depression throughout his life, however his will to win was so strong that he moved from lag cabin to White House. The tower of success was built over a series of failures. Abraham failed in business at the age of 21. He was defeated in legislative race at the age of 22. He again failed in business at the age of 24. He overcame the death of his sweetheart at the age of 26. He had nervous break down at the age of 27. He lost congressional race at the age of 34. He lost senatorial race at the age of 45. He failed to become the Vice President at the age of 47. He was elected President of USA at the age of 52. He became 16th President of USA on the Fourth March 1861. 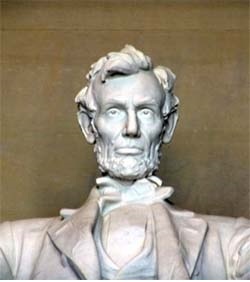 Abraham Lincoln banned slavery in USA . As a reaction he was assassinated on 15th April 1865 while he was watching a theatre. His slogan was “As you do not like to be a slave, you should not like to be a master”. You can’t strengthen the weak by weakening the strong. You can’t build character and courage by taking away mans initiative and independence. You can’t further the brotherhood of man by inciting class hatred. You can’t keep out of trouble by spending more than you earn. You can’t help men permanently by doing for them what they could and should do for themselves. Abraham Lincoln was the people’s president in the true sense of the word.